Basically what geothermal exchange does is simply to move energy to or from the earth, which acts as a giant solar collector. Air temperatures may fluctuate as much as 15°C above and below the annual average. However, only a few feet below the surface, the changes in earth temperatures are much less severe. In geothermal exchange systems during the heating season, the earth serves as a heat supply and during the cooling season, the earth serves as heat storage. 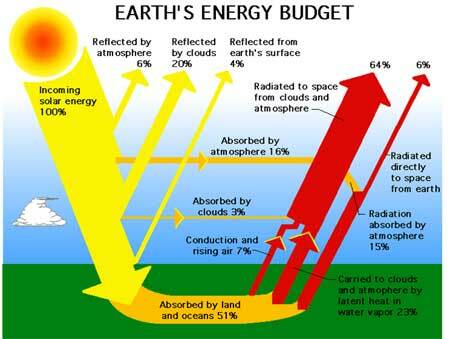 The following diagram illustrates how the earth naturally manages the renewable energy emmanating from the sun and shows that 51% of the solar energy reaching the earth is stored by land and oceans.